Justice is the indispensable basis for peace: Oscar Romero, Martyr. Today, March 24, 2015, marks the 35th anniversary of the assassination of Oscar Romero, Archbishop of El Salvador, whose martyrdom was a direct result of his outcry for human rights and social justice for the poor, and who is expected to be beatified on May 23, 2015. 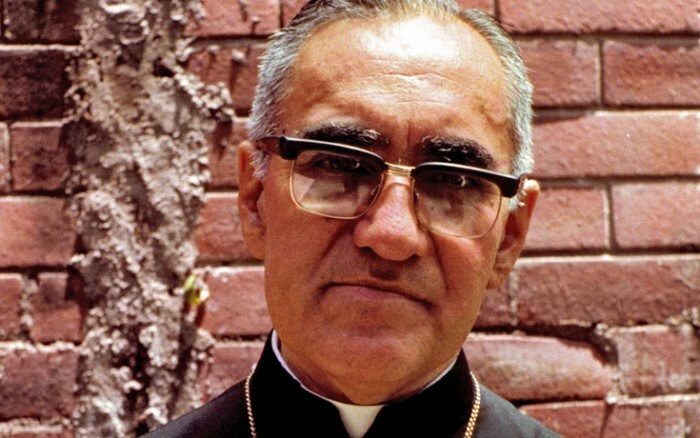 Regardless of one’s information or misinformation related to Liberation Theology, I believe Romero’s four pastoral letters, written between April, 1977 and August, 1979 should be required reading for anyone who claims to be on the side of social justice. Each letter addresses, defends, and directs the Church’s response to the increasingly grave situation faced by the suffering majority of poor and oppressed—themes which remain profoundly, globally relevant—and shines a light on Romero’s own transformation and conversion. Last year as part of my graduate studies at CTU (Catholic Theological Union) I had the opportunity read of each of these letters. What I read, pen in hand, scribbling notes in the margins lead to a personal conversion of my own, and ever since I have thought of little that did not include a reference to something Romero wrote. In light of the world situation the resounding message of Oscar Romero must be heeded. The value of Romero’s words cannot be limited to an appreciation of their historic or geographic context. Rather, they illuminate the challenges facing peace-makers in a world saturated with injustice, oppression, and violence. The effect of structural and societal sin and our responsibility to eradicate it was revealed to me dramatically through the individual experiences of Romero, his representation of the suffering endured by the Salvadoran people, and the struggle for self-understanding within the greater Church. These words: “justice is the indispensable basis for peace” [Letter 3, pg 12] hit me squarely between the eyes and led me to consider that the root of searing anger and frustration around the globe and the violent response to it emerges from the reality of the unjust, inequitable, and inhumane practices of the powerful minority. This reality is represented in every corner of our life today where we see increasing numbers of “haters,” where lashing out is the rule, not the exception, and the threat of military action is considered a “peacekeeper.” I am overwhelmed. It is not enough to simply “understand” the gospel; the liberating message of salvation has to be taken to the streets. It has to become part of one’s breath and one’s blood. It is the fire of justice, and at the same time, it is the cool water of enlightenment. Oscar Romero’s own ongoing conversion is apparent in each letter’s increasing detail, length, and urgency. In the first pastoral letter, we are reminded that the paschal mystery–the journey of Jesus from death to life–is the same transformative journey the Church must devote itself to until the end of time. As Church, then, we are an Easter people living a paschal reality [Letter 1, pg 5]. The second pastoral letter recognizes that the Church’s transcendence results both from its immersion in the temporal world, and its duty to identify and denounce that world’s “dark side” [Letter 2, pg 5]. Therefore, the Church’s prophetic mission must adapt to historical changes if it is to “bring into being the liberating love of God, manifested in Christ” [Letter 2, pgs 3-4]. This manifestation includes a share in Christ’s suffering. As Christ’s body, the Church not only proclaims the kingdom of God to the world, and in particular to the poor, who are our brothers and sisters; it is through this transformative love that we draw closer to God [Letter 2, pg 7]. We are reminded again in the third pastoral letter, that the nature of the Church, which emerges from the gospel as an evangelical community, requires an active, liberating response to the cry of the poor, a response which is a threat to those in positions of power. The fourth pastoral letter, in which Romero delves most deeply into the heart of the national crisis, reveals the extent of his conversion. Grounding his arguments in official church documents, as he had done in the three previous letters, Romero clarifies the authentic role of the Church in history, defends the Church’s right to denounce the sins of the government and of the Church itself, and challenges the Church to take up its rightful role as liberating evangelists [Letter 4, pg 16]. Please take my word for it but don’t stop there. Read these letters both for their spiritual and secular implications. Today, with the beatification of Oscar Romero, his life, ministry and martyrdom will be recognized. I think it’s appropriate to reblog this post which I published on March 24 to mark the 35th anniversary of his assassination. The post includes links to all four of Romero’s pastoral letters. When read in order, from the first to the last, the letters give witness Romero’s heroic mission to call out the unjust, inequitable, and inhumane practices of the powerful minority—a mission which ultimately cost him his life. Thank you, Blessed Oscar Romero, for your example of discipleship.